A truckload of hay is 48,000 pounds, a “small” 250-ton silo bag and a 1,000-ton pile or bunker are 500,000 and 2,000,000 pounds, respectively. The forage sample used to value hay or accurately balance a performance-based feed ration is a fraction of these sizes. A hay truckload (24 tons): This is comparable to choosing one person in a 50,000-seat baseball stadium and expecting the single person to be representative of the entire crowd. A silo bag (250 tons): This comparison is equivalent to picking one person in 10 stadiums and expecting the person to represent the combined crowds. A small forage bunker or pile (1,000 tons): More crazy yet; this is akin to selecting one person out of all of the baseball stadiums in the major leagues and expecting the individual to be representative of all the crowds across the U.S.
Now, with a few analogies to help understand the challenge at hand in accurately sampling the truckload or silo, how should you best sample dry hay, baleage or wet forage? Taking larger samples is not the answer. Bigger samples present challenges for commercial testing labs and should be avoided. 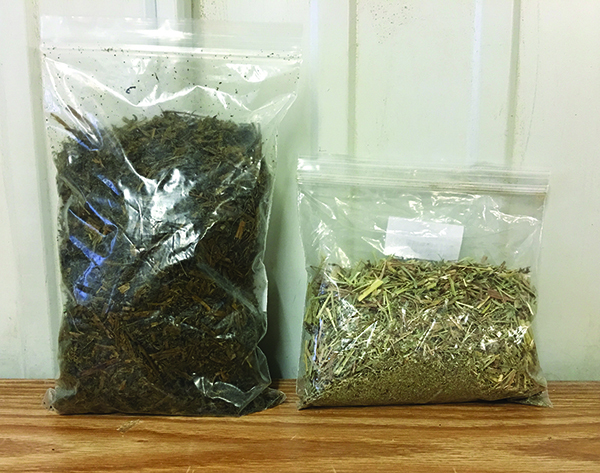 The image shows two forage samples, with the correct forage amount necessary for optimal feed analysis; stuffing the bag full is not necessary. Better sampling techniques, with just a bit more effort spent on the farm, and more frequent sampling is the superior way to accurately reflect feed value. Discuss forage variation and technique with your broker or consulting team. Decide on an agreed-upon sampling protocol and frequency, then ensure your team follows them. Consider incorporating the following guidelines into your protocol for sampling dry hay or wet forage. These guidelines incorporate recommendations from university researchers and extension personnel from across the U.S. and will help drive accuracy and precision on your farm. Consider taking a sample from each truckload or hay “lot.” A hay lot represents one field of a single cutting; multiple fields or cuttings should not be mixed. Do not attempt to split samples; on-farm sample differences when attempting to split, even with the same hay lot, can equate to 10 to 20 percent difference in value. Work with your testing laboratory to obtain dried and ground sample splits back from the lab when value discrepancies arise. Sample as close to time of sale or feeding as possible. Do not sample freshly harvested hay. Use a sharp, well-engineered coring device that is 3/8- to 3/4-inch in diameter. The corer can be hand crank or cordless drill driven. Randomly select at least 10 bales for sampling. Bales are not uniform – do not grab a sample from the outside of bale, and avoid moldy or spoiled bale sections. Use the corer to take at least two core samples per bale, collecting at least 20 cores per lot. Sample from the curved or wrapped side on round bales or in the center of the ends for square bales. For large square bales on truckloads, sample at a 45-degree angle from the side if the bale end is not accessible. Core to between 12- and 24-inch depths within each bale. Composite the entire sample (all 20 or more cores) in a laboratory-provided plastic sampling bag or sandwich- type plastic bag. Properly identify the sample with the farm name and sample identification. Submit your sample(s) to the laboratory along with a completed analysis request form or using the laboratory’s smartphone app. Work with a National Forage Testing Association (NFTA) certified laboratory (www.foragetesting.org). Appropriate forage samples, containing adequate feed forage analysis, and representing roughly 1 pound. Larger samples (for example, 1 gallon) are not necessary and can lead to subsampling challenges at the forage testing laboratory. Work to collect a composite sample into a pail or bucket. Collect subsamples using your hand as a scoop, do not grab from the top down. For upright silos: Collect at least three subsamples from the unloader during load-out, equally spaced in time from start to finish. For silo bags: Forage varies substantially through the bag length, work to represent the bag length. Ideally, sample multiple spots throughout the bag length with a sample probe, carefully seal holes created with bag tape (do not use duct tape). If sampling only during feedout, collect several times during feeding for the day. Collect a subsample from the top, both sides, middle and bottom of the bag face. For bunker silos or piles: After defacing the feed for daily feeding, collect five to 10 subsamples equally spaced out from the width of the bunker or pile. Be safe – do not sample directly from the face. Forage varies in dry matter and nutrient content from top to bottom and left to right across the face; try to capture it all, taking one subsample for every 10 feet of silo width. Thoroughly mix all subsamples in the pail, turning the feed over like a laundry machine to avoid fines settling at the bottom. This composite sample should be at least 2 pounds and with larger bunkers or piles may be 6 to 8 pounds. Use the mixing and quartering technique to decrease the composite sample size down to roughly 1 pound. Find an area of clean concrete or a counter and dump out the pail contents. Divide the feed into four subsamples, then discard the two diagonal quarters and put the remaining two quarters back into the pail, making sure to capture all the fines. This technique effectively cuts the sample size in half (for example, from 4 pounds to 2). Thoroughly mix this new subsample, and repeat the quartering process until the sample is roughly 1 pound. The mixing and quartering technique can be viewed online at http://bit.ly/4sample. Dump the entire final sample into a plastic sampling bag. Use the laboratory-provided plastic sampling bag or sandwich-type plastic bag. Do not use larger bags, such as gallon sizes. Properly identify the sample with the farm name and sample description; submit the sample to the laboratory along with completed analysis request form or using the laboratory’s smartphone app. Again, work with a National Forage Testing Association (NFTA) certified laboratory (www.foragetesting.org). Depending on your farm size, consider sampling during forage feedout at these research-developed frequencies. This article appeared in the April/May 2016 issue of Hay & Forage Grower on pages 28 and 29.